From our new series of Places to See while at Turpin Meadow Ranch, here is another fantastic option: Upper and Lower Falls, Yellowstone. One of the lesser-known marvels of both Yellowstone and natural attractions anywhere in the world, it is located within a couple hours’ drive of the Ranch. 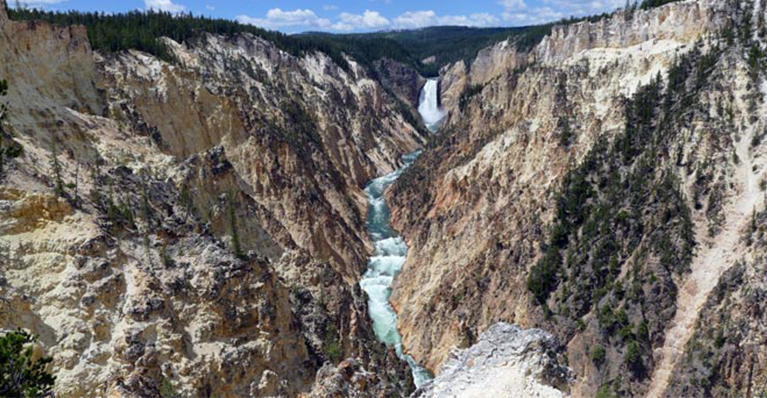 As the Yellowstone River meanders through Yellowstone National Park, it runs through a large canyon, dubbed the Grand Canyon of the Yellowstone (or “Canyon” area), and spills over two falls, one of which was described by N.P. Langford of the 1870 expeditionary Washburn party as follows: “A grander scene than the lower cataract of the Yellowstone was never witnessed by mortal eyes.” This ringing endorsement from someone who had already seen a lot of scenic beauty in the undeveloped West is one that holds true today. About 640,000 years ago, a huge volcanic eruption occurred in Yellowstone, emptying a large underground chamber of magma (partially molten rock), and volcanic ash. The roof of the chamber slowly collapsed, forming a giant caldera 30 miles across and 45 miles long. The caldera began to fill with lava and sediments, which continued for several hundred thousand years. 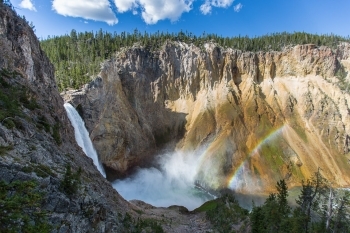 Scientists think the oldest Grand Canyon of Yellowstone formed around 150,000 years ago. This paleocanyon was not as deep, wide, or long as the canyon visible today. However, the Yellowstone River eroded the rocks that were weakened by ongoing hydrothermal activity, causing the deepening and widening of the canyon. The Lower Falls may have formed because the river flows over volcanic rock more resistant to erosion than the downstream rocks. The Upper Falls flows over similar rocks, which are remnants of a lava flow resistant to erosion. The multi-hued rocks of the canyon result from the hydrothermally altered rhyolite and sediments. Dark orange, brown, and green areas near the river indicate still-active hydrothermal features, all of which continue to sculpt the canyon. Here are a few hikes recommended to view each of these two falls. 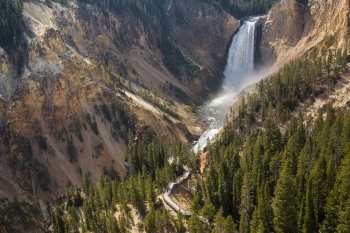 At 308 feet, the Lower Falls is the tallest waterfall in Yellowstone. It’s more than double the height of Niagara Falls, and the rate of flow runs anywhere from 63,500 gallons per second in the spring runoff season, down to 5,000 gallons per second in the dry fall season. While obviously the peak flow time will be more majestic, the warmer, drier seasons of late summer and fall tend to be preferable to visiting the park. This trail predominantly consists of more than 300 steps, surrounded by paved declines, which lead about 500 feet down into the canyon. Said to be an “unparalleled canyon and waterfall experience,” the trail’s destination is a platform from which visitors can see, hear, and feel the power of the Lower Falls. To access: Take South Rim Drive to Uncle Tom’s Point, which is near the intersection of the Clear Lake Trail. The hike is .7 miles round trip. Some notes about the trail: Uncle Tom’s Trail is considered strenuous and not recommended for people with heart, lung, or other health conditions. Much of the walk is constructed of perforated steel sheeting, so hikers should wear comfortable, flat-heeled walking shoes. Ice may be present in early morning of the spring or fall. The trail is closed in winter and subject to close in spring and fall due to poor conditions. Called Artist Point because of its stunning, often-photographed vista of the Yellowstone River’s descent starting at Lower Falls, which is framed by the multi-hue variations of the canyon walls, with a sprinkling of forest mixed in. The short hike to the viewing platform has an elevation gain of about 50 feet, and allows glimpses of the falls. At the viewing platform, visitors are able to step onto the promontory and be rewarded with the panoramic view. This is a great place for a family photo, and the lower outlook is accessible to wheelchairs. To access: start at the large parking area at the east end of South Rim Drive and hike down the wide paved trail continuing beyond the road’s end. The round trip hike is.2 miles. A distant view of the Lower Falls can be seen from some overlooks adjacent to the parking lot. 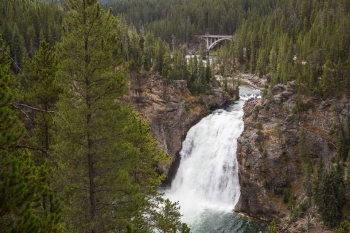 However, the Brink of Lower Falls Trail switchbacks steeply down a forested section of the Canyon to an observation platform at the top of Lower Falls of the Yellowstone. Hikers can view the powerful waterfall plunging into the heart of the Canyon. Although somewhat difficult, many hikers believe this destination to be the best view of the falls. 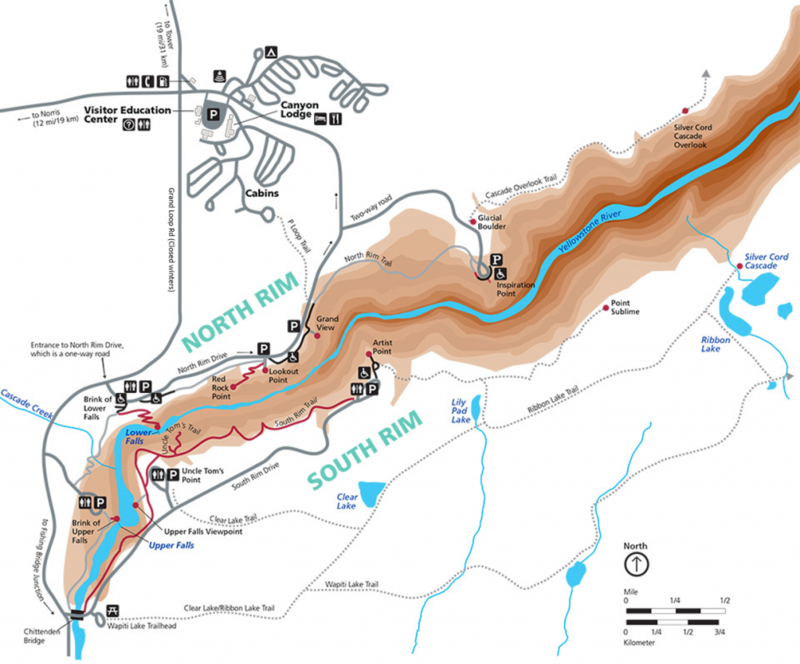 To access: take the Grand Loop to North Rim Drive and follow to the south end of the road to find Brink of Lower Falls parking lot and trailhead. The hike is .4 miles round trip. About the trail: the lower part of the trail is not recommended for those with heart, lung, or other health conditions. It contains steep drop-offs that are extremely dangerous for children. The trail is closed in winter. View the canyon from several paved overlooks adjacent to the parking lot. For a full view of Lower Falls, follow the trail that begins at the Lookout Point signs, bearing left at the fork. To access: from the Grand Loop, take North Rim Drive and enter the second parking lot which serves both Lookout Point and Red Rock Point. The minimum distance to Lookout Point is .15 miles round trip. This trail dips partway into the Canyon where Lower Falls roars close by and provides a very dramatic viewing experience. It’s fairly strenuous and includes a lot of stairs. It starts at Lookout Point, where you can see the red rock for which the trail is named, along with the stair section far below. To access: from the Grand Loop, take North Rim Drive and enter the second parking lot which serves both Lookout Point and Red Rock Point. The hike is 1 mile, round trip. About the trail: the trail is not recommended for those with heart, lung, or other health conditions. Although the Upper Falls is significantly smaller than the Lower Falls, it drops 109 ft over a lip of volcanic rock and is a very powerful and majestic sight. This short walk from the South Rim Trail takes hikers to two viewpoints of the Upper Falls without as many dangerous drop-offs at the North Rim Trail. Upstream of the waterfall, visitors can see the old Canyon Bridge, which today is part of the North Rim Trail. From the overlook on the left of the falls, look downstream to glimpse Crystal Falls on the opposite side of the Canyon. To access: Take South Rim Drive to Uncle Tom’s Point, which is near the intersection of the Clear Lake Trail. (See map below for details.) The hike is .25 miles round trip. This dramatic viewpoint can be reached fairly easily. As you walk toward the overlook, listen for the rush of water from the falls. Then proceed down the steps and around the corner to view the colliding current pouring over the brink. Walk right up to the edge of the dramatic tumbler and stare down the thundering 109 feet of water. You may see rainbows in the afternoon. For a wheelchair accessible view, bear right before the stairs and continue a short distance on the paved surface (also part of the North Rim Trail). To access: take the Grand Loop Road to North Rim Drive. The first parking lot provides access to Brink of Lower Falls. From the parking lot, it is a .25 mile round trip to the viewing platform. Some notes about the trail: Trails can be icy or snow-covered in cold weather and may be closed in winter. We hope you enjoy your adventuring while at Turpin Meadow Ranch! As always, ask our staff for any suggestions or advice, and let us know (in person, on social media, or via email) how your trip worked out! All images are © and courtesy of Yellowstone National Park/National Parks Service.